Pain is weakness leaving the body, USMC tshirt. Joke em if they can’t take a f**k.
Funerals are cheaper than college. I no longer need a wallet. Thanks BLF! How can you have any pudding if you don't eat yer meat ? Do onto others - As you would have others do onto you ! Tell them to comb the desert, do you hear me? Comb the desert! Are we being too literal? Religion: Advertising agencies for a non existing product. Not Wayne, but some other old movie. Don’t worry about avoiding temptation. As you get older, it will avoid you. “Not everything on the internet is true” Abraham Lincoln. memists, nearly all of whom attribute the saying to iconic Western film actor John Wayne. It sounds like something the blunt-speaking Duke would have said, and that’s sufficient for most people. But John Wayne didn’t actually say this, either as a line of character dialogue in a film or speaking as himself. 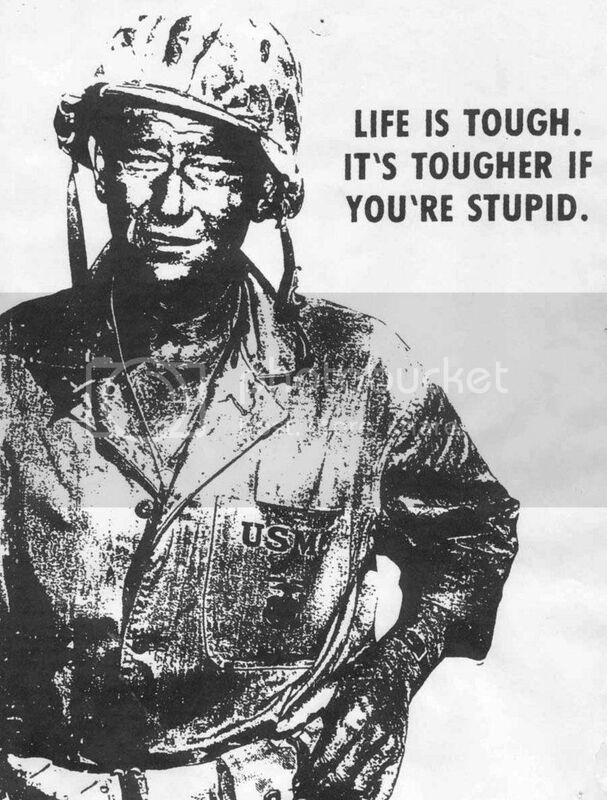 This line has been claimed of various characters played by Wayne in a number of movies, most commonly the 1949 release Sands of Iwo Jima, in which Wayne portrayed the battle-hardened Marine sergeant John M. Stryker — the IMDb even lists this saying as one of the film’s memorable quotes. But no character in Sands of Iwo Jima, Sgt. Stryker or otherwise, speaks such a line. And no one has yet turned up a film clip or script documenting the phrase as something spoken by a Wayne character in any other movie. So where did the phrase come from? Is it yet another great saying thought up by that witty sage, Anonymous? Actually, I think most of us are being taken for a ride. “Being neither jealous nor greedy, being without desires, and remaining the same under all circumstances, this is nobility.” My motto. It may be your motto but it is not your quote. Just rereading a few. Actually I think he’s right, we are the key but the locks are hidden behind a veil of apathy and fear.